The more we learn about the complexities of genetics, amino acids, the cell itself, mutations and so many other things, the more we can see that evolution is an empty, unscientific philosophy that should have been discarded years ago. For example, people still insist that the long-discredited Miller-Urey experiment regarding the "primordial Earth" is proof of chemical evolution. What did they really get from this experiment? First, cheating pays off in "science", because they started with amino acids, broke them down, and then got amino acids again. 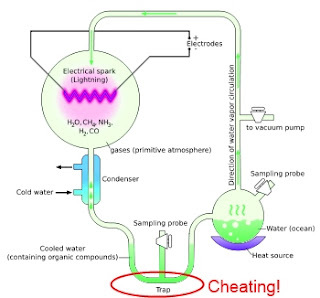 Second, it shows that intelligence, not chance, made things happen (such as the "cold trap" trick). Third, that a bad experiment (a spark does not equal a lightning bolt, get real) can yield "results" if they fit preconceptions. Even worse for evolutionists, this faulty experiment manages to argue against abiogenesis. Abiogenesis is the theory that under the proper conditions life can arise spontaneously from non-living molecules. One of the most widely cited studies used to support this conclusion is the famous Miller–Urey experiment. Surveys of textbooks find that the Miller–Urey study is the major (or only) research cited to prove abiogenesis. Although widely heralded for decades by the popular press as ‘proving’ that life originated on the early earth entirely under natural conditions, we now realize the experiment actually provided compelling evidence for the opposite conclusion. It is now recognized that this set of experiments has done more to show that abiogenesis on Earth is not possible than to indicate how it could be possible. This paper reviews some of the many problems with this research, which attempted to demonstrate a feasible method of abiogenesis on the early earth. You can read the rest of "Why the Miller–Urey research argues against abiogenesis" here.